Trust Our Reliable Team to Clear it All! Don’t let snow and ice build-up around your home and business establishment ruin your day. Get reliable snow removal solutions from Fournier Outdoor Services in Lakeville, MN. From commercial lots to small residential drives and sidewalks, our snow removal team clears all the snow and ice. We can have your driveway cleared before you leave for work, giving you more time in the morning to take care of more important matters. Unlike many companies, our services extend to clearing your sidewalks. You can count on our team to return to your property to clean up the mess left by city snow plows. Our company offers a wide range of billing options to suit your needs; we offer per storm, monthly contract, and seasonal billing options. Our team carefully marks your driveway’s edges to prevent damage to your yard. We offer three different categories for residential plowing to best suit your needs and budget: per visit, monthly contracts, and seasonal contracts. Due to the huge variety and sizes of driveways and sidewalks, we only list our starting prices. For a more accurate snow removal service quote, contact us. This option is for those who often handle snow accumulations or don't want to be billed if it doesn't snow. The visits can be on-call or based on snowfall triggers (usually 2 inches). Rates are based on area to be cleared and snowfall amount. Kindly contact us for commercial property service rates. This is similar to the 'Per Visit' option, except that the price remains the same whether we get called in for one visit or 20. Monthly accounts are all pay-in-advance. Our rates are based on the area to be cleared and trigger depth. Similar to the 'Monthly' option setup, seasonal contracts last from Nov 1st to April 15th. This option offers a slight discount over the 'Monthly' price and our rates are based on area to be cleared and trigger depth. 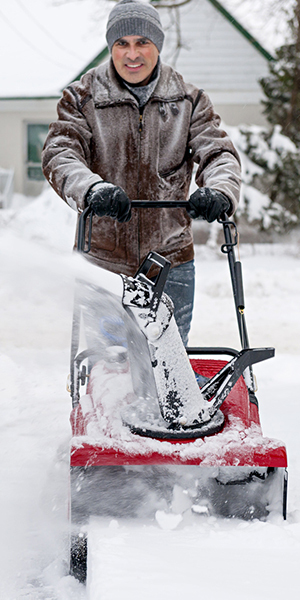 For best rates, combine snow removal along with our lawn service. Our company knows that no two properties are the same. We tailor all our snow plowing and ice removal services according to your outdoor lawn and landscaping needs. Our standard "trigger" (the amount of snow needed before we start plowing) is two inches. We can also accommodate custom tolerance triggers. We use reports from the National Weather Service as well as on-site measurements to determine how much snow has fallen. Be advised that due to drifting and localized weather conditions, your property may receive more snowfall than what is reported and not be serviced. If this occurs and you need your property serviced, feel free to call us. Our standard rates usually include clearing sidewalks and stairs to the front door at no extra cost. However, if you have an excessive amount of sidewalk area, we may charge an additional fee. We can also clear decks or patios at your request, for an additional fee. Our standard service does not include de-icing products but can be added as an option. The rates are based on the quantity used and can vary depending on availability. We, from time to time, may make spot treatments to your property at no charge. If you have environmental or pet concerns, we can avoid using de-icing products or offer alternatives. This service is available upon request, starting at $40.00, for single and two-story houses only. Your personal winter wonderland fun only lasts until you need to start clearing snow from your driveway and sidewalk. Fortunately, the professionals at Fournier Outdoor Services are ready to take the job off of your hands. Call our office today to schedule a service or request a snow removal quote. Please feel free to ask about our hardscape installation solutions as well. Privacy Statement: Any information submitted will solely be used by Fournier Outdoor Services and will not be sold, rented, or otherwise distributed to 3rd parties.